There is something stirring in America. Americans are hungry for a new political leadership that will break the impasse in Washington. Read my latest Postmedia column in the Ottawa Citizen, Calgary Herald, Vancouver Sun, Montreal Gazette, Edmonton Journal, Saskatoon’s StarPhoenix, Regina’s Leader-Post, Windsor Star, The Province, and Canada.com. Stirrings of change in the U.S.
Something is stirring in America. Because I spend a lot of time in the States talking to Americans about how Canada enjoyed such success wrestling with its fiscal problems in the 1990s, I get frequent opportunities to test the political temperature there. I spent spring break week on such a cross-border trek and have come back encouraged. That is a welcome change. Having spent most of my life as an admirer of America and its sense of destiny, of being an exceptional nation put on the Earth to accomplish extraordinary things, I have always taken our neighbours’ can-do spirit as a given. No problem appears insoluble or insurmountable to Americans, or at least so it had always seemed to me. Then I began to notice something disturbing. Each time I would travel south of the border to bring Americans a message of hope and optimism that their fiscal decline into a maelstrom of debt and out-of-control spending was neither insurmountable nor inevitable, my audience would respond with shrugs and downcast eyes. 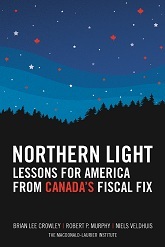 They were not reassured by the idea that if Canadians could balance their budget in the 1990s and then spend a decade running surpluses and paying down debt, then surely Americans could do so as well. On the contrary, every explanation of how Canada achieved its turnaround was met with a sad shake of the head and the firm conviction that none of the things that Canada had done could be accomplished in the U.S. This was not the America I had been used to, and it seemed to me to presage a worrying deterioration in the character of the country and of individual Americans. My recent visit, however, has given me hope that things are turning around, and not just because of the growing signs of new economic momentum taking root in the republic. After years of deadlock, things have started to move in Washington. I don’t say this to suggest that major steps are being taken that will put the country on the road to fiscal recovery. Instead, what is happening is that little things are being tried that, in due course, will help Americans see that the comfortable political nostrums of recent years are insubstantial illusions. Take President Barack Obama’s success in putting up taxes. This is part of the American left’s deep belief that if only all Americans could be made to pay their “fair share” then no government spending would ever have to be cut. My prediction is that these tax increases, and any further ones yet to come, will produce only a fraction of the revenue predicted. If they ever existed, the days when governments could simply put up taxes and raise a lot of money are over. I met a senior official in Britain’s equivalent of the finance department recently and he confirmed what I have been hearing from governments everywhere: raising taxes produces little new revenue. It is simply too easy for people to choose to spend their money in ways that the taxman cannot capture. Soon Americans too will see that tax increases are of declining relevance in fixing America’s fiscal problems. And just as tax rises will lose their appeal, spending cuts are losing their ability to frighten and motivate voters. After years of threats of dire sounding fiscal cliffs, government shutdowns and sequesters, people are becoming inured to the doomsday outcomes that are always threatened but never come to pass. Like the boy who cried wolf, those who stoke fears of the collapse of civilization if even small reductions in spending are enacted are steadily losing credibility as life continues regardless of their histrionics. Beyond all this, I was heartened by the number of Americans who told me that they are hungry for a new political leadership that will break the impasse in Washington. Just as Roosevelt and Reagan both represented a decisive break with a discredited past and the forging of a new consensus that transcended the partisan divide, the conditions are being created for the emergence of a new leader who will break the current logjam by convincing moderates in both parties to isolate their extremists by banding together on spending, taxes, immigration, entitlement reform and more. We aren’t quite there yet, and the person who can take up the mantle of leadership has not yet made themselves known. But the old solutions, leaders and parties are increasingly threadbare and discredited. Americans are ready for a leader who can show them that they don’t have to be defeatist but have it in them to rise above their narrow self-interest and do something for the country and for posterity. When that leader emerges, he or she will find millions of willing followers. How I wish they’d get a move on. Brian Lee Crowley is managing director of the Macdonald-Laurier Institute, an independent non-partisan public policy think tank in Ottawa: www.macdonaldlaurier.ca. There are people for whom the economy is always on the brink of collapse and for whom every job is precarious. For them government must always be stimulating, and the time never arrives for the second half of Doc Keynes’s therapy. That’s the part where the government steps back, hands over responsibility for growth to the resurgent private sector, and uses the tax revenues from that growth to pay down its debt. Read my latest Postmedia column below. It is also published in the Ottawa Citizen, Calgary Herald, Vancouver Sun, Montreal Gazette, Edmonton Journal, Saskatoon’s StarPhoenix, Regina’s Leader-Post, Windsor Star, The Province, and Canada.com. As Canada’s view of the recent recession moves ever more resolutely into the rear-view mirror, we are about to learn whether we are responsible enough to be trusted with the keys to the Keynesian car. Remember that the rationale for “stimulus” spending of the kind championed by John Maynard Keynes is that government must compensate for the collapse of demand by private companies and consumers during downturns. Governments borrow money and use it to spend on so-called shovel-ready projects, where plans are ready and people can be employed immediately. Even as tax revenues (that depend on private sector activity) collapse, governments can backstop the economy until the private sector’s energies are restored. The price is rising public debt, but it may be worth paying in a downturn. You don’t have to accept the theory, and Keynes has his detractors, of whom I am one. But assume Keynes is right. What do we do now that the recession is indisputably over in Canada? This is where Keynes’s acolytes often inexplicably lose interest in what their guru actually said. He was of the common sense view that since the reason for stimulus was temporary, stimulus should be, too. Once the recession is over, governments should run surpluses and pay down the debt acquired to combat the recession. Real Keynesianism swims against the economic current all the time — borrowing and spending when times are bad, running surpluses and paying down debt when times are good. But one of the reasons why Keynesianism is such a dangerous doctrine in practice is only half of his prescription is attractive to his patients, and those under his care therefore do not take all their meds. These are the people for whom the economy is always on the brink of collapse and for whom every job is precarious. For them government must always be stimulating, and the time never arrives for the second half of Doc Keynes’s therapy. That’s the part where the government steps back, hands over responsibility for growth to the resurgent private sector, and uses the tax revenues from that growth to pay down its debt. But there are logical consequences to only following half of the doctor’s orders. Every recession becomes a one-way upward ratchet in the permanent size of government. And because politicians like the pleasure of dispensing money but are averse to the pain of increasing taxes, deficits become a permanent feature at budget time because governments are unwilling to raise taxes to match their rising spending. This is a central reason why Canada ran 25 years’ worth of deficits in good times and in bad until Paul Martin and the Chrétien government decided that there was a limit to how much debt Canada could shoulder. By the time a third of all federal revenues were going out the door every year to pay interest on the burgeoning debt, we had to change course. I was on the radio the other day opposite one of these apostles of all-cake-all-the-time Keynesianism. Sid Ryan, the head of the Ontario Federation of Labour, is stumping the province making the case against an “austerity budget.” In a recent op-ed in the Citizen, he and his co-author claimed that Ontario, currently running a $10-billion dollar deficit, doesn’t have a spending problem, but a revenue problem. Let’s test Ryan’s proposition. A decade ago, Ontario was spending about $66 billion annually. Today that has risen to nearly $123 billion. Now inflation has eroded the dollar over that decade, and the population has grown, so what has happened to per-person spending adjusted for inflation? It’s up by 37 per cent. I doubt the average Ontarian thinks the value of public services has risen by that much, yet this increase in spending in real terms by over a third is now, in Ryan’s view, an untouchable baseline. If taxes don’t cover it, well, taxes should just go up. Temporary stimulus? Fuggedaboutit. As for the notion only big government can improve our job prospects, we can test that, too. Canada is one of only a handful of industrialized countries to have recovered all the jobs lost in the recession and more. We have the highest share of our population working of any G7 country. The new jobs have been hugely concentrated in private sector, full time and above-average wage jobs, including in manufacturing, where employment is rising faster than in booming mining. Raising taxes on the private sector is to kick the real job-generating sector just as it hits its stride. But then only a tiny minority of private sector workers pays union dues to Ryan; the bulk of his membership is in the stimulus-addicted public sector. Keynes wouldn’t have been fooled by the special pleading of Ryan and his ilk across the country and neither should we. It is time for Canada to close some of its many trade negotiations. Read my latest Postmedia column below, also published in the Ottawa Citizen, Calgary Herald, Vancouver Sun, Montreal Gazette, Edmonton Journal, Saskatoon’s StarPhoenix, Regina’s Leader-Post, Windsor Star, The Province, and Canada.com. The serious countries are the ones who don’t just start things, dream big and have high ambitions. The serious countries are the ones who actually get things done. In other words, it’s the closers who matter, and that’s just as true of countries as it is of baseball and sales. Canada has had a great tradition of closers on projects of national significance. Sir John A. Macdonald brought us a transcontinental railway in the face of huge opposition from those who thought the project too big for Canada. When in 1873 Sir John A. went down to defeat over a railway construction scandal, his Liberal successor, Alexander Mackenzie, thought we could get by just fine with barges and sledges in the wilderness. Louis St-Laurent got the Canada-U.S. St. Lawrence Seaway done by threatening to go it alone, forcing a reluctant U.S. President Dwight Eisenhower’s hand. Brian Mulroney got a free-trade deal with the U.S. signed, sealed and delivered, a feat that had eluded successive governments since the Americans abrogated the first free-trade agreement in the middle of the 19th century. But we can never rest on our laurels, riding on the courage and vision of those who went before, because every great project, every great decision, is only a step in history. Conditions change and new challenges must be confronted and bested. We can never be content with merely protecting what we’ve got; we have to move ourselves, our institutions, our habits and our ambitions in step with a whirl of time, circumstance and opportunity that we do not control but to which we can and must respond. We have lost many opportunities in recent years through not being able to close. At a time when employers are crying out for skilled workers, we have one of the best records anywhere at getting people into post-secondary education but one of the worst in getting them through their program and giving them a qualification. The Mackenzie Valley pipeline, that could have unlocked economic opportunity in the North and throughout the country, was studied and obstructed to death, the opportunity now passed. Other major pipeline proposals, to move Alberta’s oil to markets in Asia and the U.S., hang perilously in the balance. The road and other infrastructure needed to modernize our cities is too often held hostage to special-interest groups. We cannot close these deals despite the demonstrable benefits they would confer on Canada. One such opportunity that awaits a gifted closer is the free trade deal with the 500 million consumers of the European Union. Despite the fact that Canada is a trading nation, and that better access to foreign markets is one of the most powerful ways of raising our own standard of living, we have not concluded a trade agreement with a major economy since NAFTA in 1994. That’s 20 years. It hasn’t been for lack of trying. If you visit the website of Foreign Affairs, you’ll see the list of countries with whom we are seeking to negotiate free trade deals. It includes India and Japan and the trans-Pacific Partnership, that might open the doors to China and other growing Asian economies. But most of those negotiations are embryonic at best. The only one we got close to signing, with South Korea, has basically been defeated by opposition from the Canadian auto industry. Instead we have been signing deals with worthy countries like Jordan, Peru and Costa Rica, countries with whom our trade is valuable but microscopic. What holds us back? The benefits of open markets, lower tariffs and regulatory co-operation all lie in the future. You cannot easily put a face to the winners. For those who lose protection under free trade, however, the pain is real, immediate and quantifiable. Specific people find their job threatened. And even though it is easy to demonstrate that far more wealth is created for Canadians overall by free trade, those who lose protectionist privileges have more reason to organize and oppose trade liberalization than the beneficiaries have to support it. Thus municipalities complain that they won’t be able to favour local suppliers, provinces say they will have to pay more for prescription drugs and dairy farmers whine that Canadians might prefer European cheeses to the local stuff. All that could have some grain of truth in it and it would still be a great stride for Canadians overall to have better access to one of the world’s richest markets. But opponents are motivated, well-financed and vocal, while the beneficiaries, because they lie in the future, cannot speak today. It thus requires closers of great vision and fortitude to bring such deals home. Canada’s up one, it’s bottom of the ninth with bases loaded. We’re about to find out if we have a closer on the mound. In my latest Postmedia column, I write about global urban networks and the future of Canadian cities. Read it below. This column is published in the Ottawa Citizen, Calgary Herald, Vancouver Sun, Montreal Gazette, Edmonton Journal, Saskatoon’s StarPhoenix, Regina’s Leader-Post, Windsor Star, The Province, and Canada.com. We all know how valuable our telephone is. In fact, based on what object spends the most time in their hands, young people prize their phone above all else. So here is a thought experiment: if you owned the only phone in the world, would it still be valuable? No. You couldn’t talk to anyone. What if you had one of only two phones in the world? Great — if you wanted to talk to the person with the other phone. Even a communications system that connects you with a few thousand people only matters if you want to talk to those specific people. This is an object lesson in the value of networks. Generally speaking, the value of a network rises in proportion to the number of users squared. For the non-mathematically minded, that’s simply a fancy way of saying the more the merrier. The phone and the Internet are so valuable because practically everybody is connected. Cities form another kind of network. In the late 20th century there was a network of cities, deeply connected with each other, that ran much of the world, cities like London, New York, Tokyo, Los Angeles. They enjoyed wealth and growth because they were deeply interconnected and wealth radiated out from them to surrounding regions. Other lesser cities often mattered chiefly because they lived at the intersection of the routes between great cities. Singapore, for example, stands athwart the great trade routes linking Asia and Europe. The rise of the developing world is reconfiguring the network of the world’s great cities, and this has powerful implications for Canada and our cities. According to Paul Romer, one of the world’s leading economists, roughly two billion people will be added to the world’s population by 2050, and all of them will live in cities, chiefly in Asia. And because cities are engines of prosperity, magnifying the productivity of every one of their residents, the network of cities that matter in the world is being redrawn at lightning speed. According to Romer, in a few short years, any city of less than 10 million people will be relegated to the junior leagues. Emblematic of Europe’s fall from influence is the fact that perhaps only a couple of cities on that continent will make it into the new network of cities where the big decisions are made and the people who matter live. We will see the rise to world prominence of the Shanghais, Manilas, Mumbais, Mexico Cities and Sao Paulos, and with them whole new technologies, industries and global brands. Make no mistake, cities are networked. It is said, for example, that many venture capitalists will only invest in companies that are within a two-hour direct flight of their home city. If they have to change planes to get to you, you are off their network. I recently travelled from Ottawa to a Central American city and had to take four different planes to get there. Those cities are in different networks that hardly touch. In this global urban network, size matters. Will Canada be on the network? Only if we become more clever and honest in thinking about our own cities. In common with all the great cities, the pattern of urban growth in Canada is heavily weighted to the suburbs and exurbs, observes Wendell Cox, a prominent urban demographer. Yet, we are fixated on what is happening in the city centres. News reports abound about growth in the downtown cores of, say, Vancouver and Toronto, but are virtually silent on the hugely more important growth happening well outside the core, in places like Surrey, Coquitlam and the 905 area code. Municipalities try ever more energetically to shoehorn growth into the centre, and people ever more energetically resist, moving where they have more space, competitive taxes and better access to services and widely dispersed jobs. In Ottawa-Gatineau, 94 per cent of the region’s population growth between 2006 and 2011 was outside the central core. Fixed-line rapid transit, incredibly expensive and ill-suited to the way people move around cities now, is inexplicably all the rage, including in mid-sized cities like Ottawa and Calgary. When people lived in the suburbs and worked in the centre, heavy investment in moving people between the core and suburbs made sense. Telecommuters will soon overtake users of urban transit (they’re already there in many U.S. cities), and jobs are widely dispersed, not concentrated exclusively downtown. Road-pricing, and to a much lesser extent buses, are examples of much more flexible and effective tools than costly fixed transit networks that only serve the needs of a fraction of tomorrow’s city dwellers but please fashionable urban planners who understand little about how cities will work in the future. Canada is the fastest-growing G7 country. That growth will happen chiefly around vast cities. We must stop kidding ourselves about what working cities look like. Get it wrong and we risk falling off the network. Then, no one will answer our calls. In my latest Postmedia column, I write about why a simple majority in a referendum is undemocratic. Read it below, also published in the Ottawa Citizen, Calgary Herald, Vancouver Sun, Montreal Gazette, Edmonton Journal, Saskatoon’s StarPhoenix, Regina’s Leader-Post, Windsor Star, The Province, and Canada.com. Paris was said to be worth a mass, but it is always distressing to discover how many people think Canada isn’t worth more than a handful of votes. Both the Bloc Québécois and the NDP are busy advertising how cheap they hold their country’s integrity and future. The BQ, for whom secession is the raison d’être, may perhaps be forgiven for returning to the charge with another bill to set the bar on achieving Quebec independence as low as possible, and abolishing the Clarity Act into the bargain. The NDP, however, is another matter. This party has frequently stood four square behind Canada in the face of the separatist threat, and its courageous past leaders, such as David Lewis, Ed Broadbent and Alexa McDonough spoke out passionately for Canada. Yet today the heirs of this proud tradition stand in the Commons and, without blushing, say that a majority of one vote in a referendum should be enough to set Quebec on the path of separation from Canada. The frail reed on which the argument hangs is always that to set the bar for separation any higher is to betray Canada’s commitment to democracy itself. But as the Supreme Court wisely remarked when asked to rule on the legality of Quebec separation, democracy is part of a complex web of values. We cannot simply pick and choose the piece that pleases us (simple majority voting) and ignore the parts that are inconvenient (like obeying the law, respecting the Constitution and protecting minority rights). The Supreme Court found, not a constitutional right to secede, but a right for a province to put its case for secession to its partners in Confederation if that province met certain conditions. First on the list: a clear majority answering yes to a clear question on secession. As others have pointed out, if the judges meant a “simple majority,” they just had to say so. They didn’t. They said a “clear majority.” It doesn’t require a Jesuitical mind to find that the legal requirement must therefore be something more than just 50 per cent plus one. Nor is there anything anti-democratic in the court’s rule. People who think otherwise are confusing two very different kinds of rules. Some democratic decisions are made with a lot less than 50 per cent plus one. Some of them are very important, such as elections. As everybody knows, you can win elections in Canada with a lot less than half the vote. But there is a reason for that: somebody has to govern, and the least objectionable way to pick who should rule is to choose the party acceptable to the largest number of people. The fact that a majority of people may be opposed to the winner is irrelevant. But the fact that we accept that outcome, that we might be governed by a party supported by only a minority of the population, is itself dependent on a bunch of other fundamental rules of fairness. For example, that all qualified citizens get a vote, that the decisions governments can make are subject to protections for minority rights, that governments are answerable before independent courts for their behaviour, and that Ottawa can do things that provinces can’t and vice versa. These things are so fundamental to fairness and legitimacy that we don’t permit mere governments or even electoral majorities to change them on their own. We require big majorities before we allow these “rules of the game” to be altered. In the case of amendments to the Constitution, for example, most of them require the agreement of Parliament plus at least seven of the 10 provinces representing a majority of the population. That is a triple majority: a majority in Parliament and among the population and a two-thirds majority among the provinces. And some changes require all the provinces to agree. The government of Canada could hold a referendum to get approval to change the Constitution and they could get 90 per cent of the population to vote yes and nothing would happen unless the change was approved by Parliament and two thirds of the legislatures representing a majority of the population. That’s not anti-democratic. It is the essence of democracy that fundamental rules require special procedures and broad consent to be changed. That is what the Supreme Court meant when it said a clear majority of Quebecers needed to vote yes to a clear question before the rest of the country must sit down and discuss secession. Even after negotiating, both sides would have to ratify a constitutional amendment to effect secession. And those negotiations would have to consider the rights of minorities like aboriginal people, and those who voted not to leave Canada. The logic behind this is impeccable and, like it or not, it’s impeccably democratic too. Anyone still fondly clinging to the hoary belief that Liberals and New Democrats are natural soulmates clearly isn’t paying attention. The cross-border embrace between premiers Christy Clark and Alison Redford underlines afresh that Liberals have more in common with Tories than with New Democrats. Read my latest Postmedia column below published in the Ottawa Citizen, Calgary Herald, Vancouver Sun, Montreal Gazette, Edmonton Journal, Saskatoon’s StarPhoenix, Regina’s Leader-Post, Windsor Star, The Province, and Canada.com. Alberta’s Tories are helping B.C.’s Liberals raise money and might even be loaning them political operatives, hoping to help defeat the NDP in the looming provincial election on the Wet Coast. Anyone still fondly clinging to the hoary belief that Liberals and New Democrats are natural soulmates clearly isn’t paying attention. The cross-border embrace between premiers Christy Clark and Alison Redford underlines afresh that Liberals have more in common with Tories than with New Democrats. The political party that almost invariably wins in Canada is the one best exemplifying opportunity, meritocracy and freedom, while the losing party is often identified with the defence of unearned privilege. This has long been the pattern federally and provincially. Take the long period of Liberal dominance in Ottawa in the first half of the 20th century where the Grits spoke up forcefully for moderate taxation, open immigration, religious toleration and ending the ties with Britain. These were Main Street attitudes. The Tories were often stuck defending Bay Street, the imperial tie, sectarianism and suspicion of immigration. Old elites, old privileges. Canadians were most comfortable with the Liberals, but liked to keep the Tories in reserve, as a discipline on the arrogance of a party too used to thinking of itself as the nation’s natural government. And when the Tories did take power, their behaviour wasn’t all that different from that of the Liberals, although competence wasn’t always their long suit. Even when the Liberals were seduced by the creation of the welfare state in the ’60s, and let spending rip, the Tories followed. That suited the electorate. They had two parties reasonably close to the core values of society, so voters could change leaders without having to change fundamental policy direction. Then both parties reversed course over the deficit. That allowed first the CCF, then the NDP, to parody the other two parties as Tweedledum and Tweedledee, indistinguishable from one another. What the social democrats didn’t get was that was just what the electorate wanted. And as long as the NDP stood no real chance of taking power, that reasonably friendly rivalry between Tories and Liberals made sense. But virtually everywhere that the CCF and later the NDP grew to have a real chance of taking power, the division between Liberals and Tories became a liability. By splitting the votes of people who agreed they wanted a society of opportunity, competitive markets, free choice, moderate taxation, limited government and social programs that help but don’t entrap, the NDP could occasionally take power. NDP governments tend to have certain characteristics. They are close to the trade unions, for example, a movement dominated by public sector workers keen to expand public services, raise levels of public sector pay and pensions and remove limits on public sector collective bargaining. The party also attracts many who believe sincerely in the state’s ability to achieve fairness by high levels of redistribution, financed by high taxes, big debt, or both. There is nothing wrong with believing in any of these policies, except that Canadian voters have, with time, tended to recoil from governments that pursue them. They do so because such policies drive out investment and growth, reduce opportunity overall and create a privileged class of public sector workers. There are important regional variations of course. Prairie New Democrats are constrained by a small-c conservative culture that frowns on profligacy, for example. But on the whole, when New Democrats become major political players, the other two parties quickly learn there is a high price to indulging their separate identities. Where they successfully present a united front, they almost invariably beat the NDP. Where the anti-NDP coalition is weak or only partial, the NDP often triumphs. Which brings us back to B.C. Responding to the rise of the CCF, a formal coalition of Liberals and Tories was created. When that ramshackle construct fall apart, Social Credit stepped in, ruling for decades. When it stumbled, the Liberals rose and now are stumbling in their turn, tired from years in power and losing a few precious votes to a rump Conservative party. In between these long periods of dominance, the NDP briefly took power with rather disastrous economic consequences, forcing the anti-NDP coalition to reconstitute itself. Under the last NDP government Alberta benefited, as people and investment fled B.C. This time an anti-business NDP that obstructed every plausible means of moving Alberta’s oil through B.C. to Asia would cost Albertans as well as British Columbians. While a week is famously a lifetime in politics and the B.C. election isn’t until May, the smart money remains on an NDP victory thanks to disillusionment with the Liberals. If the NDP remains true to economic form, watch for the rapid reinvigoration of the Liberal-Tory coalition, with trans-mountain support, in time for 2017. A different approach to public sector wage negotiations is needed, one where strikes have no place. I explain why in my latest Postmedia column below, which appeared in the Ottawa Citizen, Calgary Herald, Vancouver Sun, Montreal Gazette, Edmonton Journal, Saskatoon’s StarPhoenix, Regina’s Leader-Post, Windsor Star, The Province, and Canada.com. Rotating strikes by Ontario teachers are only the latest example of what a terrible mistake we made in the 1960s and 1970s when the decision was made by various governments to enact legislation granting public sector workers the right to strike. Few today even remember that powerful public sector trade unions are a relatively recent creation. And while trade unions before the grant of the right to strike amusingly described public sector labour negotiations as “collective begging,” the very special and unusual position of public sector workers makes strikes there unusually damaging to the rest of society. After a decade of buying labour peace, the Ontario government, facing a crisis of deteriorating finances, has taken the classic last-ditch measure of all governments faced with intractable unions and their power to damage large swaths of society by stopping work. They have used a special law to put an end to this particular round of negotiations, to the fury of the unions, who are now retaliating. Surely, however, the problem is with the principle of a right to strike in the public sector, not its use in any particular set of circumstances. So rather than deal awkwardly on a case-by-case basis with the consequences of strikes, we should get back to fundamentals and ask if they are an appropriate tool for public sector labour relations at all. The reason why public sector workers were not entitled to strike before the 1970s was not some fit of forgetfulness where we neglected to include them in a right granted to private sector workers. It was a thoughtful recognition that private sector and public sector employers are simply not the same animal. Governments exercise a monopoly over the provision of many vital services in a way that virtually no private sector employer ever can. If the unionized autoworkers go on strike at GM or Ford or Chrysler, you can still buy a car from (non-union) Honda or Hyundai or Toyota. If Air Canada goes on strike, you can still fly WestJet or Porter or drive or take the train. But if the nurses, teachers, air traffic controllers or hydro workers strike, the service they represent is withdrawn. This draws the public into public sector labour disputes in a way that hardly ever occurs in private sector negotiations. And politicians always have a nervous eye on voters’ discontent. Thus for years public sector workers were essentially not allowed to strike. The consequence of public sector workers effectively wielding a veto over whether public services were available was that the state restricted the damage that power could do. There is another way in which the public sector employer is different than the private employer. Companies face the discipline of the bottom line: they must make money selling goods or services that people want to buy at prices they are willing to pay. If private employers fail this test, they go out of business. Governments cannot go out of business. They pay their bills through taxation, which means they need not trouble themselves too much about whether people think they are getting good value for their tax dollars. Finally, the customers for public services, people using hospitals and schools, for instance, don’t pay the full cost of labour settlements the way customers of private sector firms do. The costs of public sector settlements fall on all taxpayers, and those costs are all tangled up in a complex tax burden rather than a straightforward bill for a private service that consumers can understand. In the private sector, union power is in terminal decline as work shifts away from traditional blue collar occupations in natural resources and manufacturing to white collar services where people have more confidence in their own abilities to represent their own on-the-job interests and are more reluctant to see a bureaucratic third party representing their interests to their employers. Free trade and globalization mean that workers and firms in Canada must work together to overcome foreign competition. Their interests are not opposed, but aligned. The one area of the economy where unionism still holds unchallenged sway is the public sector, and that is because the unique features of government employers and the power that confers on their employees: the politicization of public sector negotiations, the lack of the discipline of the bottom line and the way the cost of labour agreements is spread across all taxpayers. These differences cry out for a different approach to public sector wage negotiations, one where strikes have no place. Governments should not be able to set public sector wages and working conditions unilaterally either, so independent third parties would have to arbitrate the demands of both sides, with the driving force a mirroring of relevant private sector wages rather than the egregious power of public sector strikes to terrify politicians and harm citizens. By “avoiding” the fiscal cliff, Americans have put off yet again their day of fiscal reckoning, comforted by the illusion that the time is not right to tackle it. The time is never right, but the job must be done regardless, and the fiscal cliff deadline was as good a moment as any to get started. Read my latest Postmedia column below published in the Ottawa Citizen, Calgary Herald, Vancouver Sun, Montreal Gazette, Edmonton Journal, Saskatoon’s StarPhoenix, Regina’s Leader-Post, Windsor Star, The Province, and Canada.com. As the American political class warmly congratulates itself over pulling back from the fiscal precipice, I make the following prediction: in the very near future this deal will not be seen as a victory, but another lost opportunity for America to get back on the path of responsible behaviour. I don’t just mean that serious countries don’t rack up trillions of dollars in deficits as a matter of course. It isn’t just that excessive borrowing is bad for public finances. The rot that long-term deficit financing engenders eats away at a nation’s moral fibre, its work ethic and the freedom and self-reliance of its people. As Canada learned when it came time to fix the deficit in the 1990s, a quarter-century of never balancing the national budget leaves you in desperate straits. One of the world’s wealthiest countries, our currency was derided as the Northern Peso at a time when Mexico was a byword for fiscal calamity. We lost our AAA credit rating. Interest payments consumed one-third of Ottawa’s revenues. Every interest group that had won some public benefit unmatched by tax increases became part of a growing chorus of voices urging Canadians to regard deficits as normal and even progressive, when they were nothing of the sort. Not only did our budgetary incontinence leave our dollar and our finances in tatters, but that borrowing underpinned a dysfunctional welfare system that saw over 10 per cent of the population stuck on social assistance by the mid-1990s. Welfare reform, forced on us by the strong medicine needed to cut the deficit, also helped to put in place a system that rewarded work; welfare dependency plummeted while the share of the population in work reached almost unheard of heights, and the number of people living on low incomes fell by 40 per cent as a result. Canada’s new-found swagger, its self-confidence, its prosperity, all can be traced at least as much to a decision to break with the irresponsible fiscal past and pay our own way as to Olympic medals, Canadian governors of the Bank of England or pride in our military’s distinguished roles in Afghanistan and Libya. And although we have slipped back into deficit due to a severe global recession, our strong economic fundamentals saw us through that painful episode better than any other G7 nation, and the government has a reasonable plan for getting us back to balanced budgets. South of the border, America remains gripped by the fear that dealing with its fiscal profligacy is beyond its strength. Like St. Augustine of Hippo, the U.S. political class prays for continence and chastity but, please, O God, not just yet. This fear sweeps reason before it like autumn leaves buffeted by the cold north wind. Yet the Americans should take counsel and solace from one of their greatest leaders, who rightly reassured his people that they had nothing to fear but fear itself. By “avoiding” the fiscal cliff, Americans have put off yet again their day of fiscal reckoning, comforted by the illusion that the time is not right to tackle it. The time is never right, but the job must be done regardless, and the fiscal cliff deadline was as good a moment as any to get started. According to much over-heated rhetoric, breathlessly repeated in the Canadian media, the fiscal cliff would have involved swingeing spending cuts. Rubbish. When we fixed our budget deficit in the mid-1990s, Ottawa cut its spending in absolute terms by seven per cent in two years. The fiscal cliff, by contrast, would have cut Washington’s overall spending by a paltry 0.3 per cent in 2013, while increasing it next year and for the foreseeable future. Under the deal just agreed to in Congress, spending cuts are put off, but taxes rise. That’s the exact reverse of what Canada learned works. Increased taxes in isolation from spending cuts give politicians the illusion that they can afford more spending because new revenues are flowing. That supposed money-spinner, the GST, for example, did not eliminate the deficit. We balanced the budget only when we cut spending. In the great reforms under Jean Chrétien and Paul Martin, spending cuts outnumbered tax increases five to one. Putting new revenues in Congress’s hands not matched by significant spending cuts is virtually guaranteed to make the problem worse if our experience is any guide. Perhaps America’s economy is too fragile for it to tolerate today Canadian levels of strong fiscal medicine. Even if America needs more time than we did, it needs a plan. None is in sight. Continuing with the current bad behaviour in the Micawberish hope that something will turn up just makes the inevitable reforms more painful and leaves to fate rather than choice the moment when the piper gets paid. America deserves better. December 21, 2012 – Canada’s pension system is not a failing system. Read my latest Postmedia column below, also published in the Ottawa Citizen, Calgary Herald, Vancouver Sun, Montreal Gazette, Edmonton Journal, Saskatoon’s StarPhoenix, Regina’s Leader-Post, Windsor Star, The Province, and Canada.com. One of the national dailies recently ran a typically alarmist front page story about the “reality that Canadians are not saving enough for retirement.” This has been repeated enough times that many people unquestioningly accept widespread inadequate retirement savings as a fact — taking its place alongside the myths that income inequality is growing or manufacturing is disappearing. Fortunately all three claims are false, but we might spend a moment looking at the hard cold numbers to see why that’s the case in the pension field. Turns out there is nothing wrong with the way we run pensions in Canada, and much that is right. Only two major OECD countries, France and Germany, have pension systems that give their average retiree a higher percentage of average pre-retirement disposable income. The Netherlands, Sweden and even the U.S., with their much more generous state schemes, end up giving retirees less income, relative to average disposable income, than Canada’s impressive 91 per cent. This is not a failing system. Canadians held $2.4 trillion in various pension plans in 2011. The value of these plans did tumble 12 per cent (or $200 billion) during the 2008 financial meltdown, but their value has more than recovered since. None of this counts non-pension savings people have stashed away for their retirement, or the value of their homes and businesses. Of course, these pension assets might be poorly distributed, with a few people having lots and many having too little. So if there’s a retirement saving problem, where is it to be found? Canada has essentially solved the problem of poverty among the elderly. The Canada Pension Plan (CPP), together with the Old Age Security (OAS) and Guaranteed Income Supplement (GIS), puts a floor below which the pension income of most retirees won’t fall. The rich are quite able to take care of themselves when they retire. So if there is a problem, it would be among the middle class. Public sector workers have, if anything, overly generous pensions plans. They certainly don’t need the government to force them to save yet more for their retirement. So we are now down to middle class workers on private sector payrolls. There is indeed evidence that some middle income earners are not saving enough to generate the 60-70 per cent of pre-retirement income generally considered suitable for a comfortable retirement. But we don’t know a great deal about these people or their circumstances. For example, this shortfall may be due to poor data that do not capture all sources of retirement income and therefore may be misleading. So if there is a problem of inadequate retirement savings, it is a narrow one. Of the two broad approaches to fix this potential problem — an across the board expansion of the CPP, or pooled workplace pensions — which is better fitted to the actual problem? Advocates of a Big CPP, like trade unions, some provinces and the outgoing head of the CPP, are aiming a howitzer at a gnat. The problem with big universal solutions to narrow targeted problems is that they increase taxes and benefits for people who don’t need them, like public sector workers, the rich, and those on low incomes who get the full panoply of CPP, OAS and GIS. Pooled pensions, by contrast, focus tightly on those who may actually need help accumulating retirement savings. The Big CPP proposal aims to force all Canadians to save more for their retirement by raising premiums and benefits. They make the easy assumption that if you force people to save, they’ll have more money on retirement. Let’s check that assumption. Canadians who participate in registered pension plans (i.e. workplace pensions or RPPs) are forced by those schemes to save. If the equation “more forced savings equals higher retirement incomes” held true, RPP participants would have higher retirement incomes than non-participants. Inconveniently for the Big-CPP advocates, they do not. Higher forced savings may simple lead them to reduce voluntary savings elsewhere, including in home equity. Our future middle-class retirees now have an impressive array of vehicles available to help them save. RRSPs are actually quite widely used in Canada, with age and income taken into account. And the removal of the foreign property rule allows Canadians to diversify their investments and hence their risk more than ever before. The introduction of the tax-free saving account has added an important new saving vehicle whose impact we cannot begin to measure. And, finally, Ottawa has recently introduced pooled pensions which add a valuable targeted tool. Unfortunately the provinces are dragging their feet on making these pooled pensions effective. They should get the lead out. Pooled pensions are a thoughtful supplement to an effective system and can make an efficient and low-cost workplace retirement saving plan available to the majority of private sector workers who currently have no such plan. Human beings add something crucial to the world: their intelligence. And the history of humanity has been one of the successful incremental application of human intelligence to the problems of nature and humanity. Read my latest Postmedia column below on sustainability and our relationship with nature. It is published in the Ottawa Citizen, Calgary Herald, Vancouver Sun, Montreal Gazette, Edmonton Journal, Saskatoon’s StarPhoenix, Regina’s Leader-Post, Windsor Star, The Province and Canada.com. Are human prosperity and well-being an illusion, bought at the expense of Nature? Human beings add nothing to the world, in this view, and subtract everything. But however much this view may appeal to, say, the apostles of environmental doom and gloom, the opponents of the oilsands and fish farming and pipelines and biotechnology, it is wrong. Human beings add something crucial to the world: their intelligence. And the history of humanity has been one of the successful incremental application of human intelligence to the problems of nature and humanity. It is not that we do not face problems. We do. But identifying our problems is only the first step to solving them. We must also look at the mechanism we have successfully used to solve every one of humanity’s significant challenges since time began: our minds. The wealth of humanity comes from mixing natural and human capital (our knowledge and experience) in differing proportions, and as natural capital becomes scarce in one context or another, we invent ways to sustain it, supplement it or replace it. Regrettably, however, the problems almost invariably arise before the solution is conceived. Indeed the problem is usually the cause of the solution’s emergence. But that means that human progress is inescapably a matter of faith: faith in the power of reason to solve our problems even when we cannot foresee what the solution will look like. It is therefore a startling presumption to say that because we can identify a looming problem, global warming say, but cannot yet see how to solve it, that we must therefore abandon our way of life — use less, consume less, eat less, procreate less, travel less, expect less — or we will destroy ourselves. This attitude puts me in mind of the recording industry executive who, in the early 1960s, famously argued that the Beatles would not succeed in the U.S. market. As the immortal advertisements for The Economist magazine so concisely put it: Have you ever wished you were better informed? The pessimists claim science backs up their view of humanity’s place in nature. The veil of intellectual respectability in which the prophets of environmental doom and gloom like to drape themselves relies on the prestige of science for its credibility. They then propose to use science as a guide for re-ordering human activities in accordance with their estimation of the number of people the planet can support (“carrying capacity”). And yet the power of science lies not in the passive observation of what is; science offers tools to the human imagination to discover ways of surmounting problems. Because of science and imagination, the carrying capacity of the planet is not fixed, but is hugely variable, depending on the leaven of human intelligence that we can add to it. Unavoidably, however, the solutions to our challenges emerge unpredictably. So in the absence of precise knowledge of the scientific and technological solutions to our problems, do we abandon hope and settle for shrunk hopes and aspirations? Or do we press on, seeking the prosperity that will allow us to do more with less, and create the technological marvels that will carry us through? We should choose to carry on. Here’s why. Our stock of knowledge is exploding at an unprecedented rate. In cutting-edge fields, such as computer science or nanotechnology, the total amount of knowledge doubles every 18-24 months, while the whole body of human knowledge doubles roughly every 15 years. One half of everything that is known today was not yet known in 1998. We as individuals are therefore condemned to ignorance. Our brain’s capacity is relatively fixed, while the knowledge known by all human beings collectively is expanding exponentially. What does this all mean about sustainability and our relationship with Nature? That we should be deeply skeptical about the claims of people who refuse to see the humanity adds something to the world: its own intelligence, and that that intelligence has repeatedly allowed it to surmount every significant challenge, often to our own amazement. We should be less inclined to accept that our rich way of life is to be junked simply because someone with a specialist’s view of a tiny piece of human knowledge cannot see whence will come the solutions to today’s problems. The solutions will come from unexpected quarters for unforeseeable reasons at unpredictable times. They always have and there is no reason to doubt that they will again. Unless we give up the search.